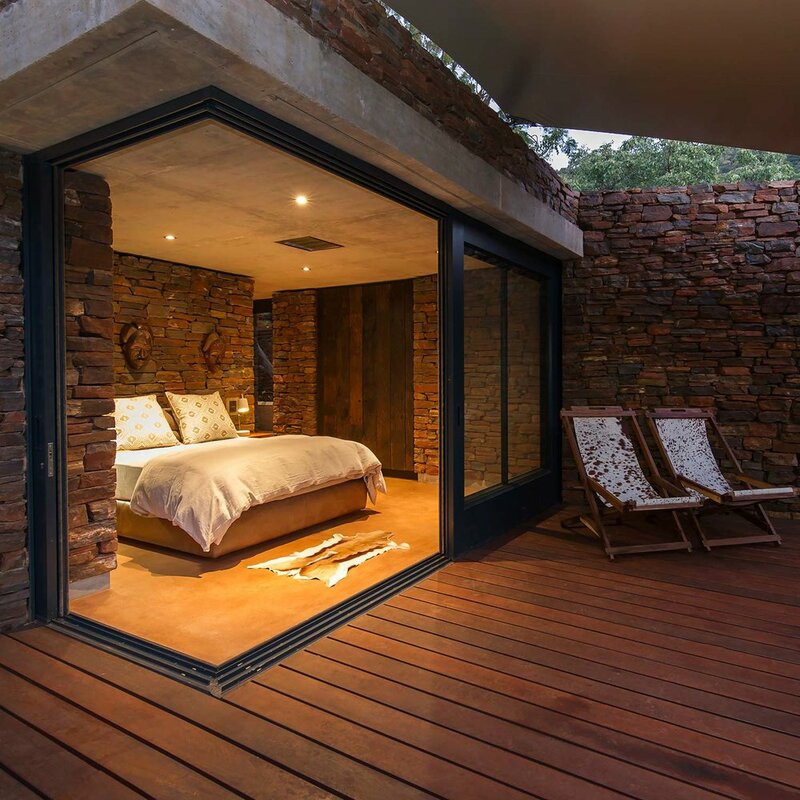 A secluded hideaway for our client to enjoy nature and their love for wildlife. This special place is hidden away on a saddle between two ‘klipkoppies’, overlooking the magnificent natural landscape of the area. The carefully considered approach leads you to a hidden parking area intentionally not spoiling the surprise element when entering the lodge. 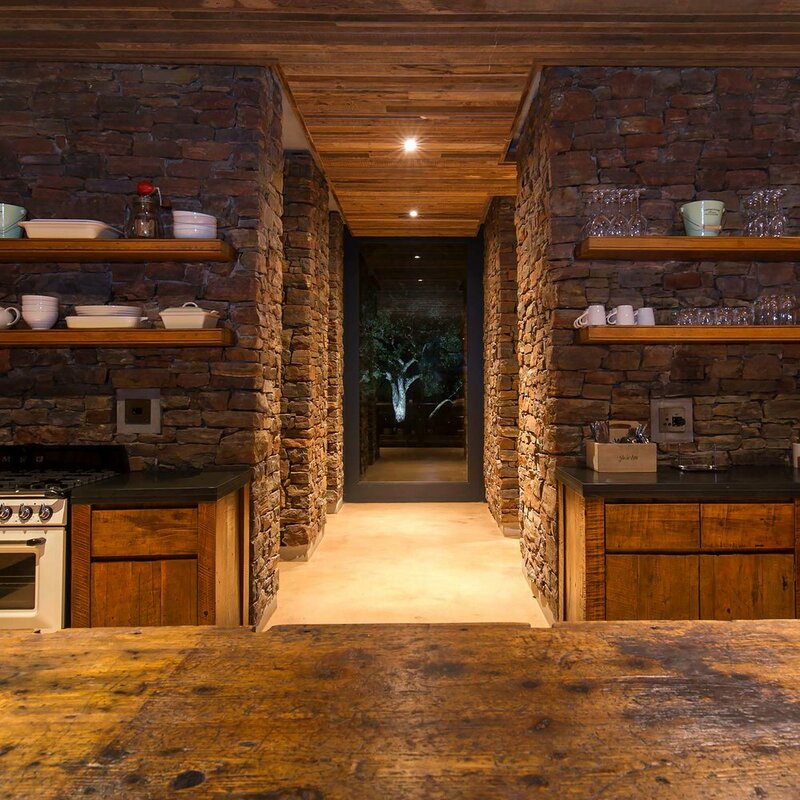 The design grew out of a series of organic stone walls reminiscent of historical farm structures. Our aim was not to lose any trees- for this reason these stone walls were sculpted around them and leads the eye out to the horizon beyond. 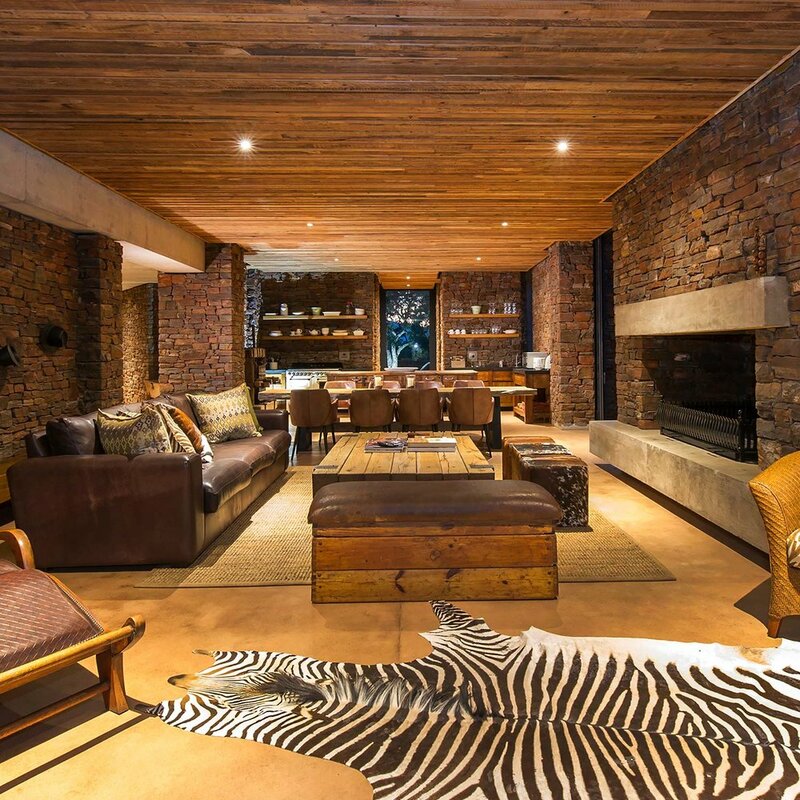 Hidden in the walls lay the various private and public spaces making up the lodge. 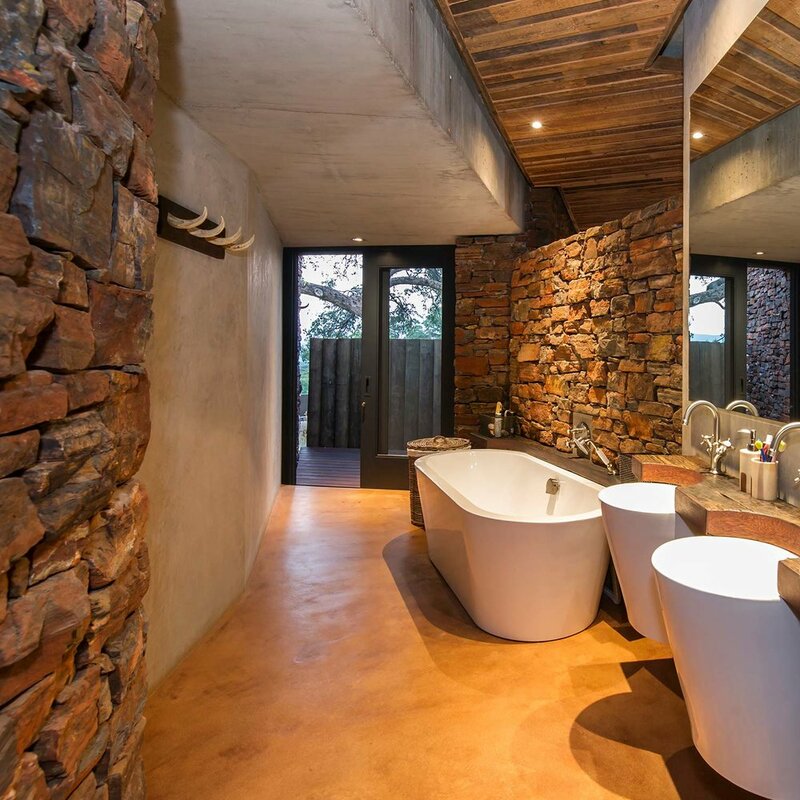 The complex consists of the main building with back of house, kitchen/dining/living leading out on a tented terrace, a pool deck and walled fire ring lapa area. 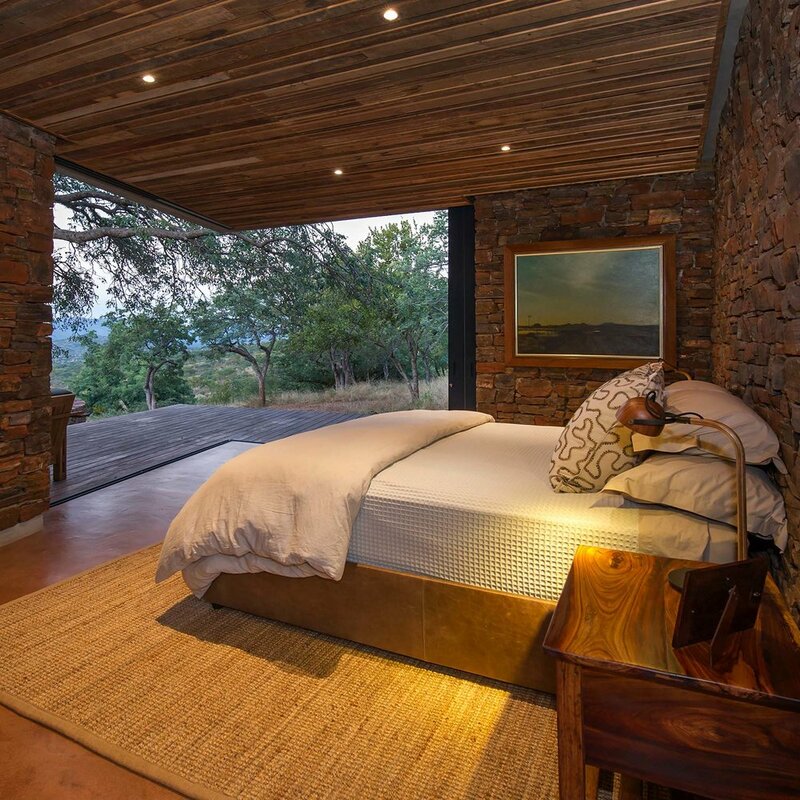 The main bedroom suite also forms part of this building, again capturing the spectacular views over the valley. A series of guest ‘tents’ are carefully placed amongst the trees, maximizing on place, privacy and the views. 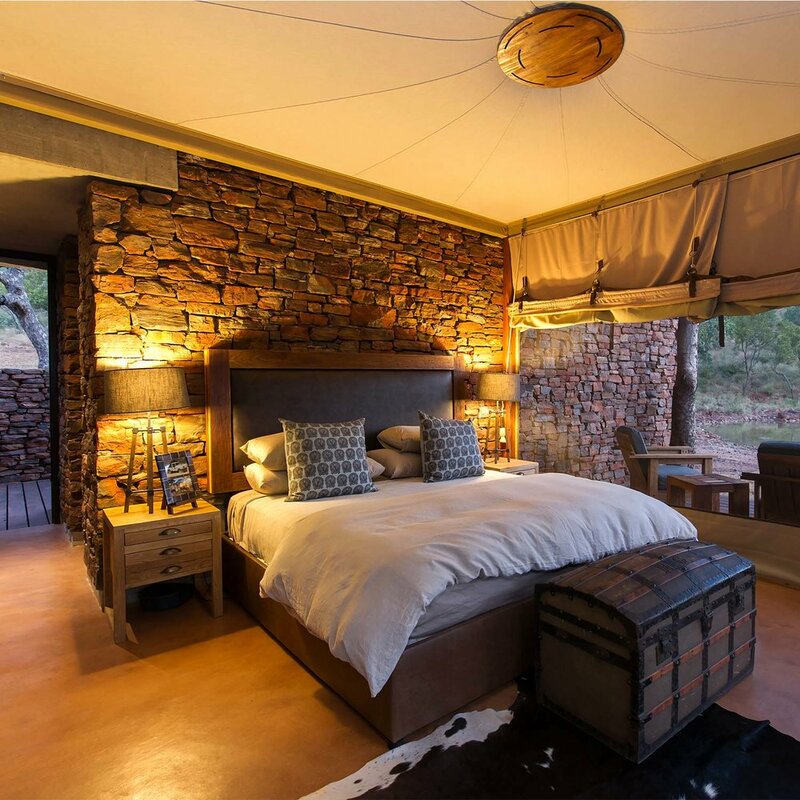 These tents consist of a solid stone structure housing the bathroom facilities and attached to it a double tent structure as the bedroom areas, floating over a timber deck. 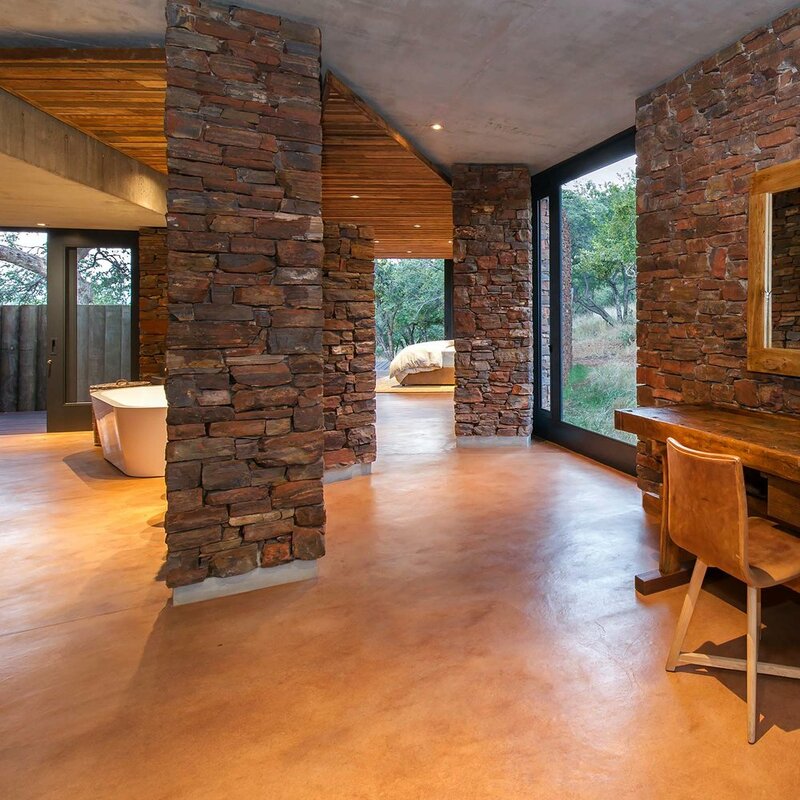 Only the immediate surroundings are carefully landscaped allowing the veld to flow further into the landscape. 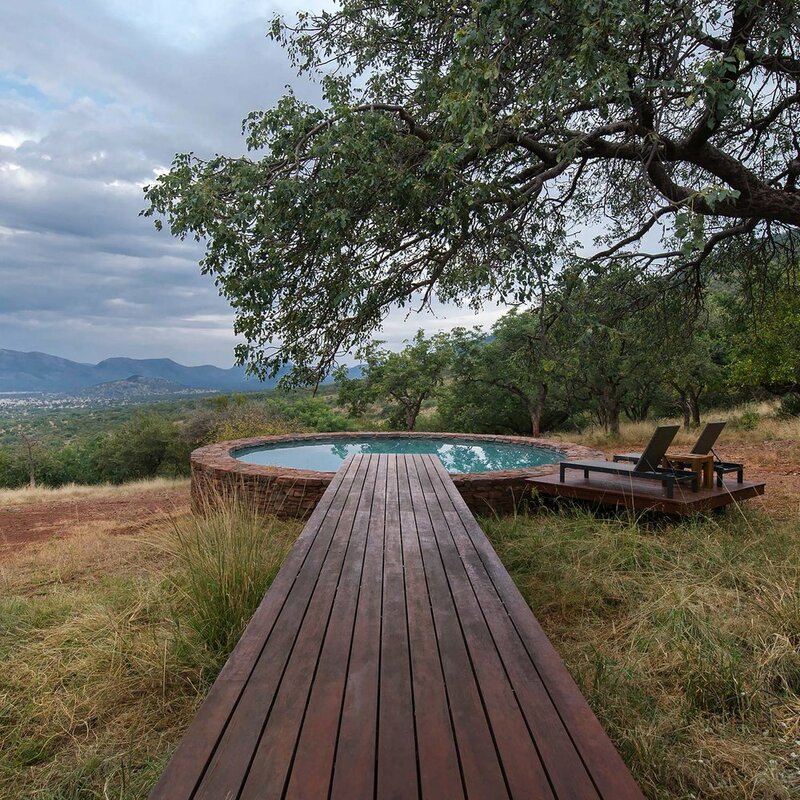 Timber deck pathways protect the indigenous vegetation. A natural dam was introduced for close-up game viewing. The solid stone walls that vine into the buildings and soil covered roofs provides for comfort in summer. Evaporative cooling is used in the main building as an ecofriendly cooling method. Tent structures extends the living spaces into nature, providing shade on the raised decked areas. The double tent structures at the guest rooms are also used to cool the sleeping areas, an old method used by experienced campers. 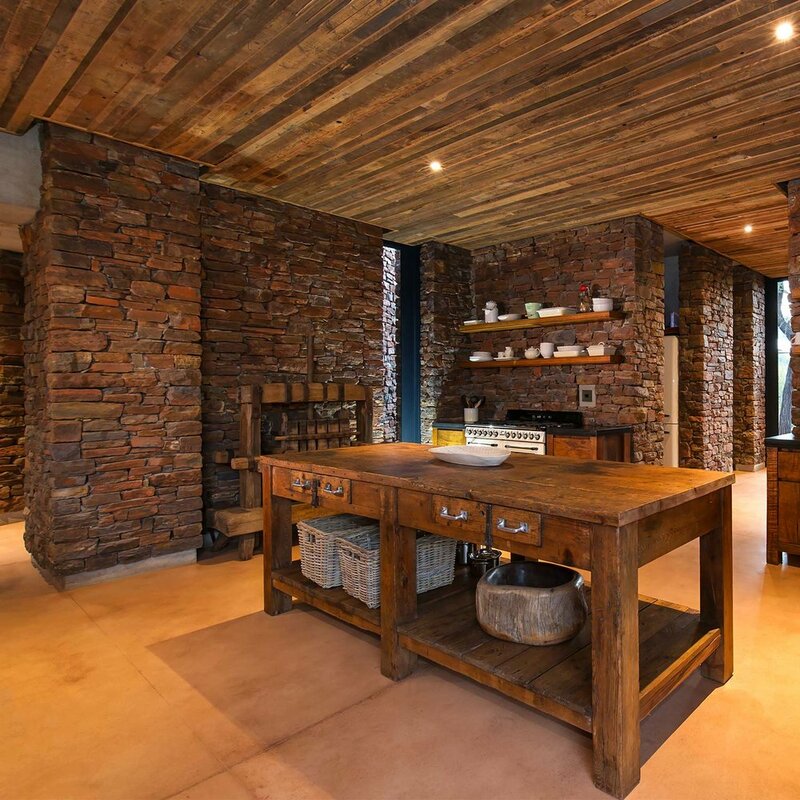 Only stone, glass, timber, recycled saw dust floors and canvas are used in the building to compliment nature. These buildings are there as a backdrop to enjoy nature, reading a book under a tent flap in the middle of nowhere. The simplicity of being in nature.